bricked devices, broken SD cards, broken hearts. The first boot will take longer than Android 4.4.4 and older ROMs. Android Runtime (ART) is slower than Dalvik at optimizing applications the first time. The default SELinux mode is Permissive. Flash the "Set_SELinux_enforcing" zip to enable full SELinux enforcing mode. p4tmo (SGH-T859): Tablet from T-Mobile carrier. 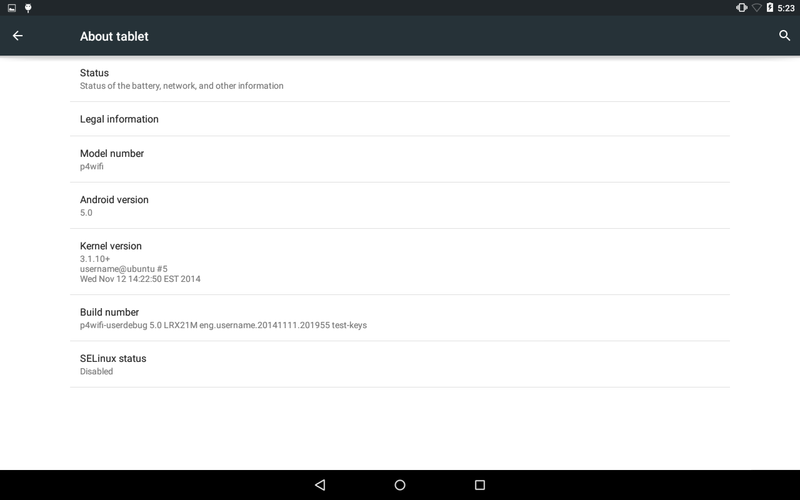 This ROM uses a new open source audio HAL written for the Android 5.0 API. Install this to use the old ICS audio HAL. The audio dock will work with this. aa33f57 Revert "bound cpu cores to same speed"
a32532a Revert "defconfig: enable graphite optimization"
c35e587 Sync libm with upstream. f9ad8a8 Get new coshl, sinhl, and tanhl implementations from upstream. 87d2724 Fix our <complex.h> support. ba0017c SampleTable: fix integer overflow checks. cc68933 Fix global-buffer-overflow in voAWB_Copy. 62c0231 Fix new vs delete mismatch. 7c7f1e1 Fatal error while playing certain mkv files. cadfa27 Fix mistake using width instead of height. f328e4f [CMFileManager] Fix can't copy after disconnect with pc. 7b09bb0 Made NavigationView reliant on FileObserver to keep up to date. cb05075 Revert "Made NavigationView reliant on FileObserver to keep up to date." 13879c7 Fix don't pop up "Actions" menu when long pressing on a file/folder after open and close "Use swipe gesture". bd79d58 Improve copy/move performance with nio and reintroduce cancel. 2eb6642 - Revert "fs_mgr: let fsck.f2fs actually attempt a fix"
87ad734 Merge "Don't set -mno-avx"
3c192ea Merge "Mark arrays of pointers as const"
d0603c3 Merge "Remove the now unused stride field from the set dimensions struct"
a306c95 Merge "Fixed encode of trailing B frames"
634567f Merge "Always do recon of 4x4 intra blocks"
1cd52d6 Merge "Don't use side effects in the macro PUT_BITS_SEV parameters"
df31683 Revert "stagefright-plugins: Restructure the code"
512a42f Revert "stagefright: Move a bunch of FFMPEG stuff out of here"
21b5b3e Revert "stagefright: Add support for loading a custom OMXPlugin"
47b6110 Revert "Add OMX_AUDIO_CodingAPE and OMX_AUDIO_CodingDTS"
f96eb86 Revert "Revert "Add OMX_AUDIO_CodingAPE and OMX_AUDIO_CodingDTS""
f662c201 Revert "SCHEDULER: Autogroup patch group by current user android UID instead of task ID"
8cb50cb Remove forced alignment code. 83e2ed3 Revert "p4-common: Avoid hotplug kernel crash"
8022b8e Make compatible with SaberMod ARM mode. df855aa Revert "lowmemorykiller: optimize for use with zswap"
49a0387 Revert "drivers: staging: android: lmk compile fixup"
8ce1cfe Revert "lowmemorykiller: Use asynchronous compaction"
f4f8fcd Revert "lowmemorykiller: Compact memory when killing processes"
08e15f9 Revert "Added frandom kernel random number generator: http://www.billauer.co.il/frandom.html"
48e8533 A local route may have a lower hop_limit set than global routes do. d76c0cd Revert "block, bfq: add Early Queue Merge (EQM) to BFQ-v7r8 for 3.1.0"
600e1ab Revert "block: introduce the BFQ-v7r8 I/O sched for 3.1"
44b7fc3b Revert "block: cgroups, kconfig, build bits for BFQ-v7r8-3.1"
7a5cae4 Revert "block: prepare I/O context code for BFQ-v7r8 for 3.1"
f531c70 block: Remove the control of complete cpu from bio. 88320aa block: warn if tag is greater than real_max_depth. 2c79fc0 Revert "block: recursive merge requests"
e2467ee Revert "block: fixes required to make the kernel compile with ROW." 8b4ef57 block: Make cfq_target_latency tunable through sysfs. 8ca5c5a Revert "writeback: fix writeback cache thrashing"
ce6ab65 mm: Fix incorrect cache attribute restoration. 6bfdfe5 mm: Avoid freeing init and initrd memory when CPA is enabled. dce2b44 Revert "defconfig: Disable SELinux"
6c554bf Revert "libc: Cache large /etc/hosts files"
a7cf34b Revert "audio: Reduce device switch delay"
9d84b5d Revert "video: tegra: remove free memory check"
446a27e Revert "block, bfq: add Early Queue Merge (EQM) to BFQ-v7r7 for 3.1.0"
c22600d Revert "block: introduce the BFQ-v7r7 I/O sched for 3.1"
caaa9ce Revert "block: cgroups, kconfig, build bits for BFQ-v7r7-3.1"
2ea3d7f Revert "block: prepare I/O context code for BFQ-v7r7 for 3.1"
0d31e17 [CMFileManager]Fix the FileManager Crash. 9a75e1b [CMFileManager]Fix CMFileManager sometimes crash. 4b2a184 Revert "libc: tegra2: Try again Cortex-A9 optimized memcpy"
d110a43 Revert "mkfs.f2fs: 512 UTF-16 characters for label"
fb629ad Ensure there is no two same storages showing on the computer. f519217 audio policy: validate stream type received from binder calls. d851d89 Revert "nuplayer: Modify seek and resume latency calculation"
e48b311 Revert "nuplayer: do not use cached source for wvm content -- DO NOT MERGE"
2df81c2 Revert "Revert "DimLayer : remove unnecessary surface transaction calls""
e62470c Revert "Revert "Remove the window whose client process has died or become zombie""
549dd1e Revert "Revert "Improve concurrency by propagating B services to higher adj""
4c3616f Revert "Revert "hwui : fix memory leak due to duplicate in shadow cache""
55d2439 Revert "aggressively blacklist WifiConfiguration for the purpose of switching network"
3fb6d1c Revert "f2fs: enhance multi-threads performance"
8e9f5aa ipv4: Missing sk_nulls_node_init() in ping_unhash(). 0029ee9 Revert "Revert "kernel:sched: LOAD_FREQ (4*HZ+61) avoids loadavg Moire""
d31abd7 Revert "Revert "android: lowmemorykiller: squash task adj rbtree optimization from Motorola""
aaedf1c Revert "cpufreq: interactive: Remove trace event from idle_start handler"
f77ca4f Revert "cpufreq: interactive: Reset floor_validate_time if busy at max for 100ms"
4711923 Revert "defconfig: Enable tegra errata"
Fix no sim card detected for p4. I haven't encountered any freezing after these changes. It now has ICS audio wrapper by default. This should be suitable for most users. I think it is only those who use the audio dock that need to install the old ICS audio HAL. f354b2a Revert "libc: tegra2: Cortex-A9 optimized memcpy"
8c44c03e Revert "mutex: Place lock in contended state after fastpath_lock failure"
31cd532 Revert "ARM: 7587/1: implement optimized percpu variable access"
23a755f Revert "ARM: mutex: use generic atomic_dec-based implementation for ARMv6+"
b664aa6 Revert "ARM: 7467/1: mutex: use generic xchg-based implementation for ARMv6+"
652814c Revert "DimLayer : remove unnecessary surface transaction calls"
0cfc66b Revert "Remove the window whose client process has died or become zombie"
e6977b3 Revert "Improve concurrency by propagating B services to higher adj"
cb61503 Revert "hwui : fix memory leak due to duplicate in shadow cache"
57348aa Revert "CHROMIUM: media: tegra: set the clock rate of avp.sclk for T20/T25"
ea20ddc Revert "PowerHAL: Set interactive go_hispeed_load to 95"
eed8b4d Revert "cpufreq: interactive: Add get_cpu_idle_time() to for 3.1 compatibility"
450ce14 Revert "cpufreq: interactive: Update from hammerhead kernel"
062577f Revert "android: lowmemorykiller: squash task adj rbtree optimization from Motorola"
c6c5386 Revert "introduce for_each_thread() to replace the buggy while_each_thread()"
Revert "PowerHAL: interactive scheduler settings from grouper"
[ActivityManager] Prevent provider from been created twice. [ActivityManager] fix NPE in ActivityStack.resetTargetTaskIfNeededLocked. [ActivityManager] Ensure provider external access count will be released. [ActivityManager] Improve task order of getRunningTasks. [ActivityManager] Fix index out of bounds when updating next pss time. Avoid deadlock between ActivityManagerService and ProcessStatsService. [ActivityManager] Fix process record leakage. Prevent system server dump stuck by pipe buffer full. [ActivityManager] Fix activity always visible. Revert "[ActivityManager] Set appropriate relation of task to home"
Revert "Revert "[ActivityManager] Set appropriate relation of task to home""
Revert "[ActivityManager] Improve task order of getRunningTasks." [ActivityManager] Avoid killing unrelated processes. Revert "third part apps can unlock the phone without password even if the phone has setted the password"
Remove unnecessary sleep in ActivityThread. Revert "ResolverActivity: fix null pointer exception"
Revert "ARM: Tegra: Added support to run at two frequency modes"
Settings: Add option to scramble pin layout when unlocking (1/2). Keyguard: Add option to scramble pin layout when unlocking (2/2). Add global scramble pin layout setting. Revert "defconfig: disable HW crypto engine"
Revert "Revert "arm: config: p4wifi: Enable zRAM options suggested by Google""
See post #980 for additional notes. - Do a full wipe then install the ROM. - Default SELinux mode is Permissive. Install the "enforcing" bootimage if you want to enable SELinux. I did not merge Android 5.1.0 into my 5.0.x sources. The necessary changes were cherry-picked from my 5.0.x sources on to the new Android 5.1.0_r1 sources. I've gone back to using the AOSP repositories for Bluetooth/bluedroid and frameworks_av instead of CyanogenMod. I don't know what their timeline is for moving to CM-12.1. The 3G parts from OmniROM have been updated. I hadn't bothered to update it previously out of fear of breaking it. I only have the WIFI tablet so 3G is untested. Most other things should be working the same as with the AOSP 5.0.x ROM. Revert "arm: config: p4wifi: Enable zRAM options suggested by Google"
- Low Power Mode power hint caps the maximum frequency to 456Mhz. - Remove non-existent input_boost and boost_factor (gone in kernel 3.4 interactive scheduler). - Refactor nonsensical logic in p3_power_set_interactive. - setInteractive on: set go_hispeed_load to 85 . setInteractive off: set go_hispeed_load to 99.
system/core: Revert "fs_mgr: Use fsck.f2fs auto fix flag"
Revert "kernel:sched: LOAD_FREQ (4*HZ+61) avoids loadavg Moire"
Revert "cpufreq: Report correct min/max frequencies." See post #799 for additional notes. See post #722 for additional notes. See post #463 for additional notes. If there are any problems with the new audio HAL then please save a logcat of the problem and send it over! If we can get it working without many problems then we can get rid of the old ICS audio blobs forever. This will make it easier to port present and future ROMs. To go back to the old ICS audio just install the p75xx-ICS-AudioHAL-20141222.zip package. See post #387 for additional notes. To revert back to the ICS audio HAL install this. It's just the audio HAL from the 20141222 ROM. This is for testing. This audio code will not be included in the regular builds yet. See Post #351 for more info. Switched from userdebug to user build. Switched to healthd charger. No longer using the old LPM charger method. Fix Email app crashing at start up. --- Panorama does not work. --- Might be working since 20150620. Might be buggy for some. Install ChainFire SuperSU zip in recovery. It is a bug in newer versions of Chrome. Only Google can fix it. Use Chrome 29.x or older for HTML5 video playback. Update - 2015-05-14 - Chrome version 42.0.2311.111: HTML5 videos are not crashing but they only work in full screen mode. Use Voodoo Sound app to increase the headphone amplification. Set quality to 480p or less. * Can we fix laggy video playback? Can we fix Youtube HD video? * Why can't we fix video playback? The video drivers and codecs are closed source. We cannot modify it. We cannot debug it. There are no other video drivers or video codecs except for the ICS drivers and codecs. Video streaming technology advances but we are stuck with old drivers and codecs from ICS. * Can we use ICS / Jellybean / Kitkat video drivers? We have always been using ICS video drivers. There is no other driver. Every ROM for this tablet is using the ICS video drivers. * Youtube HD worked with ICS ROM. Why doesn't it work now? The drivers are outdated. The video drivers are from 2011. The recent Youtube app is using 2015 streaming technology. * Can we write new drivers? Can we update the drivers? No. There is no open source code. There is no technical documentation. We can't do anything without both of those. There is no where to start from. There is nothing that can be modified. * Why is there no open source code or technical documentation for video drivers? They are closely guarded NVidia secrets. They will not release it to the public. * Can't mount USB storage. How to mount USB storage? The only app for voltage control that is officially supported by this kernel is SetCPU. Most apps use the same kernel interface for voltage control but none of the app developers agreed on a standard interface. For that reason it is impossible to support all apps. Do not use any other app for voltage control. * Do CyanogenMod themes work? * Do Touchwiz themes work? * Swipe gesture not working with stock keyboard. Swipe gestures will not work with the stock keyboard. Install the Google Keyboard. It requires a proprietary library from Google. This closed source module does not work on this tablet. * I have some other problem. Send me system logs and describe in detail what the problem is. See Problem Reporting Steps below. Root the device by installing ChainFires SuperSU. Damn! I definitely wasn't expecting this so quickly since it took so long for KK to arrive for our tab. Thanks a lot for this. Hopefully we can see a p4 build since it has almost the same source tree as p4wifi. Even if we can't, I'd still be flashing this on my p4. I can test it, but I can't test the 3g since I don't have a sim card for my tab. Laggy or very usable like omni rom by AAccount? The performance is similar to Kitkat. It didn't get much better or worse. Good work!! Can you release the Sources of this rom so I can build it too and help you to improve it! Small question, I did my twrp backup and downloaded everything. Now, can I just restore my cm10.2 backup is I don't like how lollypop runs on my tablet? Edit : I flashed the gapps and its all good. I guess there is no way to make the tab faster though right ? I just tried to flash this rom. When I flash it the first time I couldn't do anything (ie open the browser, open play store etc). Every app was crashing. I then tried to flash it twice in a row. The problem is after flashing it once, TWRP disappeared when I tried to boot the recovery. Instead I had the dead android with a read triangle with a "!" inside. Thank you for helping and thank you to the developer that cooked this. Wow, thank you for your great work!